December! Seattle CC Insanity (Dec 31); Seattle CC Saturday Quads (Dec 31); Portland CC G/60 (Dec 31) - Steven Breckenridge won the last tournament of 2011 at the Portland CC, the monthly G/60 event, with a perfect 4-0 score. 12 players took part in the event directed by Michael Morris; North American Open (Dec 26-29), Bally's Las Vegas, NV - Click here for standings - Several players from Washington, Oregon and Idaho took part. 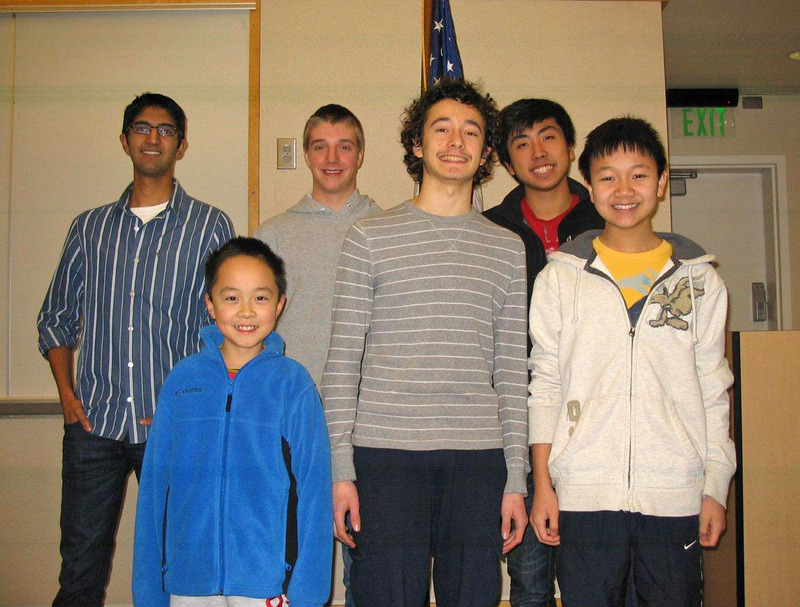 The top prize winners from Washington state were Naomi Bashkansky (U1250, place 1-4, 6 points out of 7, undefeated), Masayuki Nagase (U1700, place 2-5, 5.5 points out of 7, undefeated), Igor Ummel (U2100, place 2-6, 5.5 points out of 7, undefeated). These Washington and Oregon players also got prizes: Terrance Li, James Wang, Peter J. Sherman, Trey Michaels, Anthony L. Lamb, Ethan Bashkansky, H.G. Pitre, Noah Fields, Colin Field-Eaton; Portland Winter Open (Dec 17-18) - Curtis Brooks won this event with a score of 4.5-.5 in the 12-player Open Section. Frederick Davis and Dagadu Bapurao Gaikwad topped the Reserve Section with 4-1 scores. 20 players took part in this section. 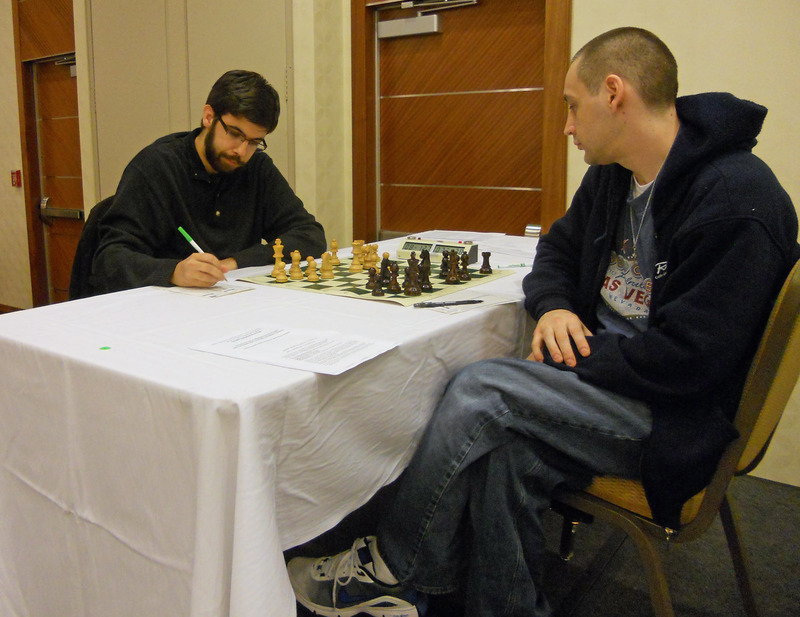 Gregori Alpernas served as TD; Portland Blitz Chess Championships (Dec 18) at Portal Games (reported by TD Galen Pyle) - This event was very successful. We had 26 participants for the six-round double Swiss tournament. I think that the players had fun and appreciated the fast pairings. Steven Breckenridge won the tournament with 11.5/12. Stephen was undefeated in the tournament until the last round when Radu Roua sacrificed a rook for a perpetual. John William placed second with 9/12. Third place was a three-way tie between Mike Goffe, Becca Lampman and Nate Khingratsophone. The bughouse tournament after party was won by Steven Breckenridge and Steven Witt; December Active #2 (Dec 18) in Vancouver, BC; Christmas Congress (Dec 17) in Tacoma, WA - Murlin Eugene Varner Jr. of Woodinville, WA topped the results crosstable of the Christmas Congress with a 2.5-.5 score. Seven players took part including TD Gary Dorfner. The event was sponsored by the Tacoma CC and held at their club site; Santa’s Quads (concluded Dec 16) in Tacoma, WA; Seattle Sunday Tornado (Dec 11) - 15 players took part in this monthly event. Viktors Pupols was the top rated player in the event and he won it, 3.5-.5. Marcel Szabo was able to nick Vik for a draw. Fred Kleist was the TD; Spokane G/10 (Dec 10); Western Idaho Open (Dec 10-11) in Boise, ID; Corvallis/Albany Open (Dec 10-11) in Corvallis, OR - Steven Breckenridge won the event 4.5-.5, drawing with Nick Raptis, who placed 2nd with 3.5-1.5. 14 players took part in the Open section. Yogi Saputa won the 10-player under 1800 section, also 4.5-.5. Dan Dalthorp directed the event; December Active #1 (Dec 4) in Vancouver, BC; Portland Chess Shop's Chess Rapids at Portal Games (Dec 4) - This event attracted 15 players, with a G/29 time control. Steven Breckenridge won with 4-0. Galen Pyle directed the event; Seattle Saturday Quads (Dec 3). Scholastics (December)! See USCF crosstables of 2011 National Youth Action West event, held Dec 10-11 in Irvine, CA. Several players from Washington and Oregon took part. Photos: Kyle Haining receiving 1st place trophy from David Hendricks. (Kyle won the 4th – 7th grade open section of the Thanksgiving Scholastic with a perfect 5.0. ); Nick Raptis and Dereque Kelly; Ignacio Perez and Dereque Kelly; Josh Sinanan and Raptis. Dereque was the winner of the WA Class Masters section. The 2011 WA Class Championships cross tables list 131 players under the direction of Fred Kleist. A few players who had byes in their section played a game that round in another section. The Master section was won by Dereque Kelley with 4.5-1.5. It had 22 players. The Expert Section had 8 players and was won by David Zick with 4.5-1.5. He had not played any rated chess for about 5 years. The A Section winner was Becca Lampman with 5-1 over 25 other players. The B Section drew 30 players with the winner being Matthew Nills. Class C had two winners at 4.5-1.5, Murlin Varner and Sangeeta Dhingra with 21 players taking part. Class D of 17 players also had two players scoring 4.5-1.5, Boas Lee and Howard Hare. Class E winners were Howard Hwa and Kirill Filimonov at 5-1 and 26 players in the section. As you would expect with players paired against others with nearly the same rating there were quite a few drawn games. As usual for Seattle-located events most of the players were Washington State residents. There were two from Oregon, four from British Columbia and one from Minnesota (but a former Washington player). See photos on Northwest Chess Facebook page; Portland CC Club Championship (ended Nov 29) - Nick Raptis and Steven Deeth both scored 4-1 in the 13-player Portland CC Championship. Games were played at rate of one a week. Steven beat Nick but was held to draws by 3rd place finisher Robert Lundin and Jeremy Waterman; Portland CC G/60 (Nov 26) - The event had 16 players. Jerry Sherrad of Portland topped the field with 3 wins and a draw. Mike Montchalin of Pendleton was among those with 3-1. He has not played rated chess for several years. Neil Dale of Portland directed and played also; Seattle CC Sunday Tornado (Nov 20); Tacoma CC Fall Quads (Nov 19); 29 players made the trek to Missoula Montana for the Turkey Open (Nov 12-13). The 5-0 winner was Ted Belanoff, rated 2146, from California. Scoring 4-1 were John Julian and Mike Murray, both of Washington. They tied for 1st place in the 24-player 2010 edition of this event. There were seven players from Washington (mostly Spokane area), only one from Idaho, the rest from Montana plus the winner. The chief TD was Daniel McCourt and the sponsoring affiliate University Community CC. 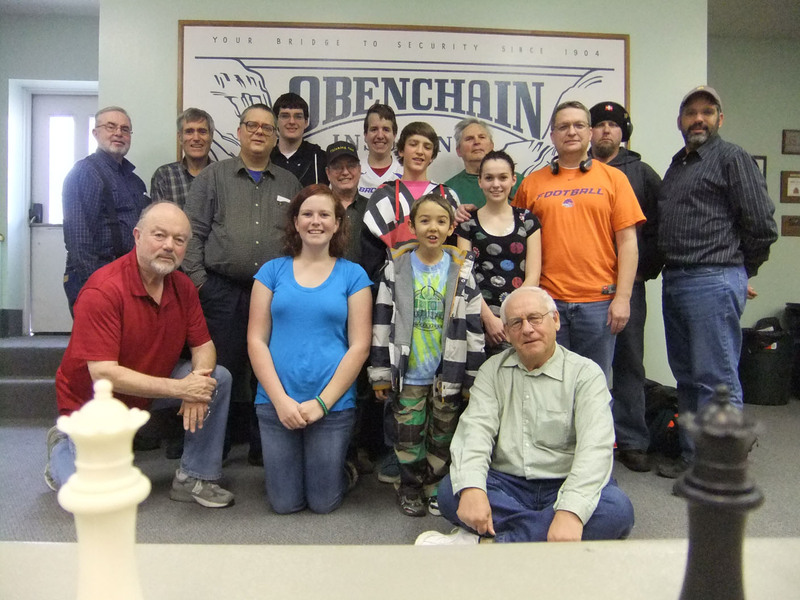 Southern Idaho Open (Nov 12 in Twin Falls) - group photo shown; Oregon Class Championships (1400+ on Nov 11-12, U1400 on Nov 13) - This event was held at the Portland Chess Club under the direction of Dale Wentz of Keizer, OR. A total of 33 players took part. The Master/Expert Section was won by Steven Breckenridge with a perfect 4 wins score. At 3-1 were Nick Raptis and Daniel Gay in the 10 player section. The Class A section of seven players was won by Micah Smith with 2 wins and 1 draw plus a 1/2 point bye. The nine players in the Class B/C section were topped by the 3.5-.5 score of Alexander Mueller-Warrant. The under 1400 rating section had eight players, only one of which was unrated. The winners of this section were Praveer Shakan and Cameron Green at 3-1; Seattle CC Saturday Quads (Nov 12); Jack Taylor Memorial (Nov 12-13 in Victoria, BC) - see the results on the Victoria CC website; Tacoma CC Blitz Championship (Nov 11); Seattle CC Championship (Sep 9-Nov 11) - This event was won by Fred Kleist of Seattle with a 6.5-.5 score. 17 players took part. Fred was also the TD. Seattle CC Extravaganza (Nov 4-6) - Nat Koons and Roland Feng finished with 6-1 scores in the Seattle CC Extravaganza. Patrick Van Dyke was 3rd at 4.5-2.5. Feng lost to Koons but Koons was held to draws by Van Dyke and Viktors Pupols. 16 players took part in the Open section, three of them only paired for one round. The Reserve Section was won by Dan Mathews at 5.5-1.5 (three draws) in the 19 player event. Fred Kleist was the TD, assisted by his wife Carol; Byron Massey Memorial Chess Tournament (scholastic and adult, Nov 5 in Coquille, OR); Portland Chess Shop Unrated G/30 Tournament (Nov 6). Scholastics (November)! Players from Washington State performed well in the National K-12 Chess Championships in Dallas, Texas, on November 18-20. Stanley Zhong won 9th place in the 1st grade section. Aaryan Deshpande won 8th place in the 2nd grade section. Marc Huang won 12th place in the 3rd grade section. Also in the 3rd grade section, Asher Thakur won 1st place U800. Kyle Haining won 7th place in the 6th grade section. Ethan Gottlieb won 8th place in the 12th grade section. In the National K-6 Blitz competition on November 17, Kyle Haining won 5th place, Noah Fields won 8th place, Marc Huang won 1st place U800, and Asher Thakur won 2nd place U800. Photo: Kyle Haining (and his trophies) courtesy of Breck Haining. The Washington State Mini-Teams Championship was held at Interlake High School on 11/19. There were 24 three-player teams, 70 players in all. TD was Rick Jorgensen. The winners were: 1st Interlake (A) - Michael Wang 5.0, Abinav Viswanathan 4.5, Andrew Porisch 4.5; 2nd Lakeside (B) - Darren Wu 4.0, Peter Sherman 4.0, Nicholas Xing 4.0. October! Seattle CC Novice (Oct 30); Portland CC G/60 (Oct 29) - Nick Raptis was tied by Vlajko Lakic for first place. Both scored 3 wins and a draw. Nick drew with Steven Breckenridge in round 4 and Vjajko drew in round 2 with Steven Witt. 22 players took part in the event directed by Jon Fontune; Washington Challengers' Cup, Seattle, WA (Oct 29-30) - Harley Greninger won the Open Section with a 3.5-.5 score in a field of 25 players. In 2nd place with 3-1 were Joshua Sinanan, Viktors Pupols and Huso Hadzic. Joshua Doknjas of BC won the Reserve Section with a 4.5-.5 score in a field of 22 including two unrated players. Fred Kleist was the TD; EAC Tournament #10 (Oct 29-30 in Surrey, BC); Tacoma CC Championship (concluded Oct 28); Spokane Chess Club Fall Championship (Oct 27) - A night of make-up games nearly brought an end to the club's fall championship, but one more make-up game this weekend is necessary to settle the prize winners. John Julian won his make-up game to join Michael Cambareri as co-champions; they each scored 4.5 to top the field; Western States Open (Oct 21-23 in Reno, NV) - See report (and a few games) on the USCF website - The Seattle Chess Club won the team prize; Portland Fall Open (Oct 15-16 at Portland CC) - Steven Breckenridge won the 16- player Open Section with 4 wins and a draw with Brain Esler. Brian had three draws in the event and tied with Curtis Brooks for 2nd place at 3.5-1.5. The Reserve Section ended in a tie at 4-1, with top scores achieved by Dan Oswalt and Frederick Davis. Oswalt lost to Davis while Davis lost to James McAleer. Among the 15 players in this section were two unrated players. The Chief TD was Gregori Alpernas; Seattle Saturday Quads (Oct 15); Vancouver Open Chess Tournament (CFC Rated, Oct 8-10) in Surrey, BC, Canada; Seattle Sunday Tornado (Oct 9); Washington Team Championship (Oct 8) in Seattle; Oyster Bay Inn Classic (Oct 1-2) in Bremerton, WA - David Rupel of Olympia, WA won the 10-player open section with a 3-1, two draws score. Premier section of 11 players was won by a score of 3.5-.5 by Mathew Nill. Nine players took part in the reserve section with Thomas Taylor having top score of 4-0. Kitsap County Chess Club was the sponsor with Kristen Dietsch handling the TD part; Eastern Washington Open (Oct 1-2) in Spokane - The Spokane Chess Club reports on Facebook: "2011 Eastern Washington Open crosstable is up on USCF website. Congratulations to winner John Julian, and to section winners John Dill (B), Dave Griffin (C), Pat Kirlin, Maria Naess, and Nathaniel Scapopo (D and under), and to Jerry Morton for winning Biggest Upset." 35 players took part under the direction of Kevin Korsmo. Rusty adds that "Mark Erickson came in second place clear with a 4-1 score. He had not played OTB chess since 2007 per the MSA USCF records." September! Seattle Fall Open (Sep 23-25) - Viktors Pupols scored 4.5-5 to top the 26-player Open Section of this SCC event. 2nd at 4-1 (one draw, one 1/2 bye) was Huso Hadzic. Six USCF-rated masters took part. 25 players took part in the Reserve Section which was won also with a 4.5-.5 score by Jothi Norio Ramesh. Fred and Carol Kleist were the TDs; Portland G/60 (Sep 24) - The September PCC G/60 was won once again by Nick Raptis. He scored 4-0. There were 20 players who took part, four from Washington. Neil Dale was the TD; Eastern Idaho Open (Sep 24) in Pocatello, ID - 14 players took part in the two-section 2011 Eastern Idaho Open. Caleb Kircher scored 3.5-.5 to top the 10 player Open section. Cindy Hanson won all three of her games to top the reserve section. Jay Simonson did the TD duties. For six years recently this had been a two-day event, but only one day this year; Tacoma Chess Club at Puyallup Fair Education Bldg. (Sep 18-19) - See photos by Rusty Miller; Seattle Saturday Quads (Sep 17); Seattle CC Sunday Tornado (Sep 11); Washington G/60 Championship (Sep 10) in Tacoma; Oregon Open (Sep 3-5) in Gresham, OR - See photos taken by Rusty before the event started, See USCF report about this and other Labor Day events - Another round number for a chess tournament in Oregon. A few weeks after the Portland Chess Club Centennial it was time for the Oregon Open in Gresham. The organizers (Portland Chess Club) were a bit worried about a drop in the attendance, but it turned out to be near normal. 90 players came came to the tournament (43 in the Open Section and 47 in the Reserve). In the top section Nick Raptis was the winner with 5 points, despite not playing the last round. 5 players shared 2nd through 6th with 4 1/2 points: Steve Breckenridge, Daniel Gay, David Rupel, Peter Lessler, and Michael Wang. Robert Fisette lost his first game, but was undefeated after that, and took clear first in the U2000 section with 3 1/2 points. Gordon Higbie was a clear winner in the reserve section with 5 1/2 points. James McAleer, Philip Placek, and Aaron Pikus shared 2nd through 4th with 4 1/2 apiece. Gabriel Skoro and Jeremy Coste shared the top spots in the U1400 group with 4 apiece. Sebastian Clark and Venkat Doddapaneni shared the top prize money in the U1200 group with 3 points each. Junior players in the reserve section also had the opportunity to play at a $15 entry fee for non-monetary prizes. The winner here with 4 1/2 points was Dillon Murray. Second in this category went to Leonardo Sun with 3 points. Mt. Hood Community College once again provided the playing site. The tournament was directed by Grisha Alpernas and yours truly (Neil Dale) assisted, i.e., the Baltic Mafia at work again! The organizers would like to thank all who came to play and make this tournament a success; Langley Chess Club Labor Day Open (Sep 3-5) in Langley, BC, Canada. Regional/National Events (August)! As reported by USCF, "GM Michael Adams won the 1st Metropolitan International (August 17-21 in Los Angeles, CA), with 7.5/9, a full point ahead of the field. GMs Loek Van Wely and Timur Gareev tied for 2nd-3rd with 6.5/9. Washington's Michael Lee achieved an IM norm, the only norm reached!" Four Washington State players competed: Michael Lee, Howard Chen, Josh Sinanan and Dereque Kelley, who won a brilliancy prize in a game against a 2383-rated opponent. See a report with the game and Dereque's notes on chessvibes. | See all game scores on our "other games" page. August! Portland G/60 (Aug 27) - 17 players took part in the Portland CC monthly G/60 event. Nick Raptis and Steven Breckenridge finished on top tied at 3.5-.5. They drew in round 4. Neil Dale was the TD. 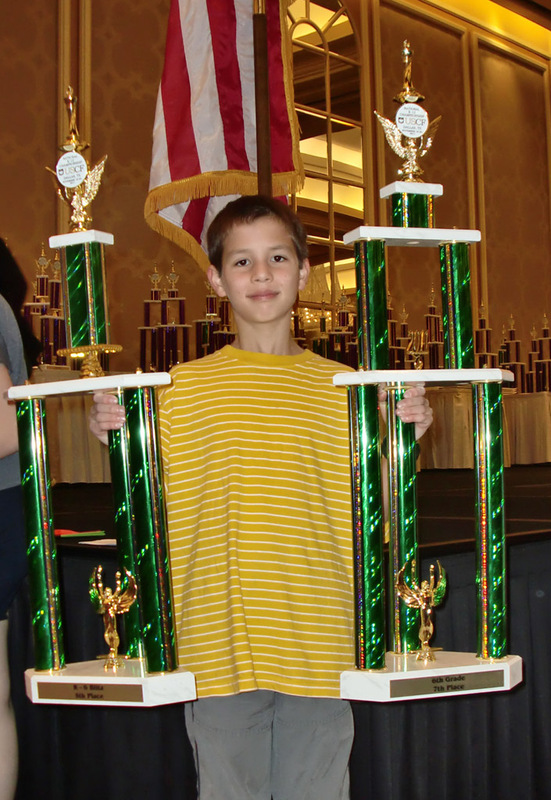 According to the USCF website, he has now directed 314 events since 1991; August Albany Open (Aug 27 in Albany, OR); Nickola L. Pazderic won the Seattle Chess Club Dog Days (Aug 5 to 26). He won the three games he played and had one 1/2-point bye. 28 players took part, three of them playing in their first tournament. Fred Kleist directed the event; Pierce County Championship (concluded Aug 26 in Tacoma); Seattle Saturday Quads (Aug 20), Meridian Invitational Chess Tournament (Aug 20) in Meridian, ID - Corey Kenneth Longhurst won this event with a 3-1 score. The event had 7 players and was directed by Frank Niro; 78th Puget Sound Open (Aug 20) in Tacoma - Paul Bartron of Tacoma won yet another Tacoma Tournament, the Puget Sound Open. His score was 3.5-.5. Peter O'Gorman and Paul drew in round 2. Gary Dorfner as usual directed the six-player event; 2nd Annual Pioneer Square Chess Tournament (Aug 21) in Seattle; Portland CC Centennial Open (Aug 12-14) - As noted in Frank Niro's blog, Giorgi Orlov, Nick Raptis, Bindi Cheng and Loren Laceste each scored five points in six rounds to finish deadlocked atop the 54-player Championship section. Robert Herrara won the Amateur section with a perfect 6-0 score, while Susan Polgar scored 10-0 in the clock simul (see her event photos); see selected games on the games page; see full page of reports and photos; Washington Speed Chess Championships (Aug 13, Chess4Life Hosted) in Bellevue, WA; Portland Saturday Quads (Aug 6); Yakima Mini-Swiss (Aug 6 in Toppenish, WA) - Gilbert Chan won the Yakima Chess Club August Swiss with a 3-0 score. Only four players took part in the event directed by Jim McAleer of Yakima; Newport Run/Chess Championship (Aug 7). Regional/National Events (July-August)! The 112th US Open was held in Orlando, Florida (Jul 30-Aug 7). See the crosstable for full results. Three NW players scored 6-3: Carl Haessler of Lake Oswego OR, Dakota Dixon of Bothell WA and Marus Robinson of Portland OR. Dixon was hard to beat -- he lost only one game. Look for the usual report by Murlin Varner in the September issue of Northwest Chess. You can play or just come watch the 113th US Open without traveling across the country as it will be held in Vancouver WA, Aug 4-12, 2012. Youth Events (July-August)! 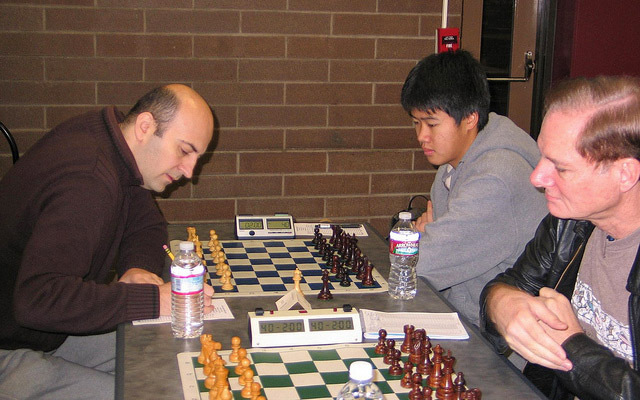 The Washington State rep David Golub (rating 2188) of Bellevue finished with a 4-2 score in the Denker High School Champions tournament, losing to the two master-rated players who finished first and second. He beat the master who finished tied for third. David finished 8th out of 50. The Oregon State rep was Aaron Pikus (1483) of Beaverton, and his 2.5-3.5 score placed him 35th. Idaho sent C. Harmon-Vellotti (1879) and he scored 2-4 to place 38th. The crosstable is here. Youth Events (July)! Heather Young of Vancouver, WA finished 18th out of 46 players in the 2011 Susan Polgar Invitational Championship for girls. Most of the entrants were champions or co-champions of their respective states. See the crosstable. The winner was the highest rated player, Apurva Virkud, from Michigan with a perfect 6-0 score. Heather has been given an automatic invitation to next year's event where she will be one of the top contenders for one of the three scholarships to Texas Tech University worth over $40,000 to out-of-state students. Photo: TD Frank Niro, Susan Polgar, Heather Young, Ron and Peggy Young. Photo courtesy of the Susan Polgar Foundation. Also see an article about Heather in The Columbian newspaper. See article about Idaho participant Savanna Naccarato. Regional/National Events (July)! Annual U.S. Senior Open (Jul 18-23), Houston, TX; Current Washington Chess Champion Howard Chen of Monroe tied for 1st place with 4.5-1.5 in the 16th Pacific Coast Open held July 14-17 at Agoura California. The other 4.5 scorers were 2500+ rated titled players all of California: GM Melikset Khachiyan, IM Enrico Sevillano and IM Andranik Matikozyan. Chen drew with Khachiyan in round 6. Chen lost a game to FIDE Master John Daniel Bryant of Missouri who is rated 2478. Chen's USCF rating continues to climb and is now 2379. Steven Breckenridge split the U2300 prize (1st and 2nd places) with three people scoring 4 of 6. Photo: Players compete at the Oregon Senior Championship, July 9-10. Co-champion Steven Deeth (left) faces off in the foreground against Expert Carl Koontz in Round 3, and shows the comfortable playing conditions at the Pioneer Community Center in Oregon City. Photo credit: Frank Niro. July! Portland CC G/60 (Jul 30) - 29 players under the direction of Neil Dale played 4 rounds in one day in the monthly G/60 event at the Portland Chess Club. There was a three-way tie for 1st place with 3.5-.5 scores: Daniel Gay of Tigard, Preston Polasek of Gresham and Jerry Sherrard of Portland. Gay and Sherrard drew with each other in round 3 and Polasek took a 4th round half point bye. These events are both quick and regular rated. Seattle CC Novice (Jul 30); Spokane Falls Open (Jul 30-31); Seattle CC Seafair Open (Jul 22-24) - This event, held at the Seattle Chess Club, ended in a three-way tie with scores of 4.5-5. Howard Chen of Monroe, David Golub of Bellevue and Nathan Lee of Issaquah were the players. Chen and Golub drew in the 5th round while Lee drew in round two with Daniel Hua. The result by Golub made his rating go over 2200 for the first time. Fred Kleist directed the 67 player event which had a prize fund based on 60 players; 3rd Wed. Quick Quads at Seattle Chess Club (Jul 20); Portland Summer Open (Jul 16-17) - Both sections of the Portland Summer Open had clear winners. The Open section of 19 players was won with a 4-1 score by Brian Esler of Portland. Steven Witt's of Beaverton score of 4.5-.5 took the top place in the 2nd section of 25 players. The event was held at the Portland Chess Club under the direction of Neil Dale; Seattle Sunday Tornado (Jul 17) - 24 players took part in the Seattle Chess Club July Tornado. The result was first place tie at 3.5-.5 between David Bragg of Bothell and Igor Ummel of Arlington. They drew in round 4. Fred Kleist directed the event; Oregon Senior Championship (Jul 9-10) in Oregon City - Mike Janniro of Portland and Steven Deeth of Beaverton tied for 1st place in the Oregon Senior, players age 50 and older. They scored 4-1 drawing with each other in round 5. Frank Niro directed the event, and 17 players took part; Seattle CC Saturday Quads (Jul 9) - The Seattle CC July Quads had 28 players in 7 sections under the direction of Fred Kleist. Igor Ummel won the top quad 2.5-.5. Nicolo R. Gelb scored the perfect 3-0 in his section. Another perfect score was Masayuki Nagase. The next section had two people score 2-1, Jiayi Hu and Matthew Song. Another section was won by Toshihiro Nagase with 2.5-.5. Matthew Coopersmith playing his 19th-22nd rated games won all three to top his section. Gordon B. Guttmann playing in a 5-man section scored 3-0 as did Daniel J. Metz; 1st Wed. Quick Quads at Seattle Chess Club (Jul 6); 48th Evergreen Empire Open (Jul 2) in Tacoma - The event was advertised as 5 rounds in two days but due to there only being 12 entries the event was cut down to one day and 4 rounds with a faster time control. Kyle Haining and Alan Walk tied for 1st with 3.5-.5, they drew in round 4. The event was sponsored by and held at the Tacoma Chess Club under the direction of Gary Dorfner, who played as a houseman for two rounds; Portland Saturday Quads (Jul 2). Regional/National Events (June)! 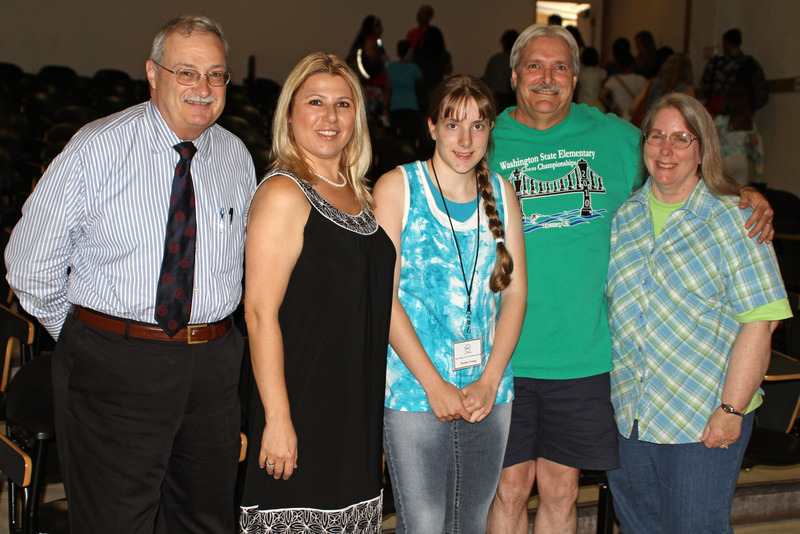 Las Vegas International Chess Festival and National Open (Jun 9-12) - Some of the Washington and Oregon residents who took part in the National Open came home with cash! 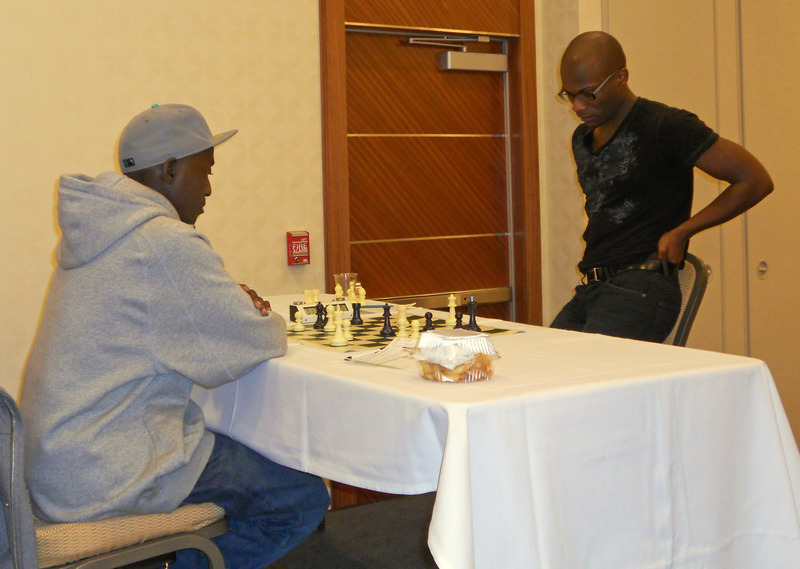 Dereque Kelley of Seattle (2226 FIDE) tied for under 2300 prize with 3.5-2.5, winning $200 in the Open Section. Also in this section were Gil Lapid Shaffiri (2168 FIDE) who scored 2-3 and Dakota Dixon (2070 FIDE) who had 2.5-3.5, but neither won money. In the U2200 Section cash winners were Washington players: Darren Wue (1946 FIDE, 4.5-1.5, $277), David Rupel (2125 FIDE, 4-2, $40) and Fred Kleist (2110 FIDE, 4-2, $40). Other scores in this section: Alexandra Botez, OR (1942 FIDE, 3-3), Steve Merwin, WA (2062 FIDE, 3-3), Dale Hammer, OR (2165 FIDE, 2.5-3.5). In the U2000 section Jerry Sherrerd, OR (1937) scored 4.5-1.5 winning $229. Mike Schemm, WA (1995) scored 3.5-2.5 and Mika Mitchell, WA (1876) scored 3-3. One WA player cashed in the U1800 section, Jeremy Krasin (1760) with 5-1, good for $520. Stephen Buck, WA (1700) in this section scored 3-3. Carol Mayer-Kliest of Seattle scored 3-3 in the U1600 section. The U1400 Section had the big winners, both from WA: Peter J. Sherman (1318) and J. Mies (1221) both scored 5-1, good for $1,200 checks. Mies was a reentry person after he lost his first two games. $208 cash was won in this section with a 4.5-1.5 score by Dhruva Chatterjee (1352) of Oregon. 622 players took part in 7 sections. It appears the prize fund was $80,000 since the 850 based on entries was not reached. Full details on the event can be found at http://www.vegaschessfestival.com/. June! Tacoma City Championship (concluded Jun 24); Emerald City Open (Jun 24-26) in Seattle - The Emerald City Open and Reserve was held at the Seattle Chess Club. The open section was won by the top rated player Howard Chen with 4.5-.5. He drew with Igor Ummel in round 5. 2nd place in the 27 player section went to Peter Lesser with 4-1. The under 1700 reserve section of 25 players ended in a tie at the 4-1 score between Kerry Van Veen and Sangeeta Dhinga. The tournament director was Fred Kleist; Portland G/60 (Jun 25) - Steven Breckenridge won yet another G/60 event at the Portland CC. The June event had 23 players in which Steven scored 4-0. At 3.5-.5 for clear 2nd place was V. Alexandra Botez. Neil Dale was the TD; Seattle Saturday Quads (Jun 18); Newport June Open (Jun 18-19), Newport, OR - Patrick Gay pulled an upset and defeated master Carl Haessler of Lake Oswego in round 5 to win the Newport June Open. Gay's final score was 4.5-.5. 23 players took part in the event sponsored by the Central Coast CC. The tournament director was William Barrese. The same number of players took part in the 2010 tournament, and there were 25 in 2009; 3rd Wed. Quick Quads at Seattle CC (Jun 15); Seattle Sunday Tornado (Jun 5); WA Senior Adult Championship in Tacoma (Jun 4) - Paul Bartron of Tacoma and Patric Hessen of Federal Way tied for first place in this event held at the Tacoma CC on June 4th. They drew with each other in round two and won the other three games. Eight players took part including tournament director Gary Dorfner of Tacoma; Portland Saturday Quads (Jun 4). Memorial Day Holiday Weekend! Washington Open (May 28-30) in Renton, WA - reports moved to a separate page. Washington Champion Howard Chen took part in the open section of the 2011 Chicago Open over Memorial Day weekend. He won $714.29 with his 5.5-3.5 score for part of the under 2300 FIDE rating prize. Dereque Kelley also played in this event but scored 4-5 with four draws. Michael Schemm played in the Under 2100 Section and scored 4.5-2.5. There were 647 players but the turnout was less than last year. More details at http://chicagoopen.net/. Scholastics (May)! See "Chess team at North Portland's Astor School celebrates national championship" from The Oregonian. The team of four boys became national champions in the K-6 unrated section of the United States Chess Federation National Championship held in Dallas, Texas. May! Blitz Against Hunger (May 28) unrated G/10 chess tournament in Richland, WA; 36th Annual Paul Keres Memorial Chess Tournament in Richmond, BC, Canada (May 20-23) - IM Georgi Orlov tied with Maxim Doroshenko, each scoring 5.5 points in 7 rounds. Orlov has now won the Keres a record 10 times; Portland G/60 (May 21) - 14 players took part in the monthly G/60 event at the Portland Chess Club. Four Oregon resident players scored 3-1, Nick Raptis, Curtis Brooks, Brian Esler and Shreesh Nanda. Brooks beat Rapits, Esler beat Brooks, Raptis beat Elser and Brooks beat Nanda. Alex Grom directed the event; Yakima CC Mini-Swiss in Toppenish, WA (May 21); Tacoma CC Mini-Swiss (May 20); 3rd Wed. Quick Quads at Seattle Chess Club (May 18); Seattle Saturday Quads (May 14); Inland Empire Open in Spokane (May 14-15) - John Julian of the Spokane Chess Club won the 29-player Inland Empire Open. His score was 4.5-.5, the draw was with 2nd-3rd place finisher Nikolar Bulakh (4-1). The other 4-1 was Pat Herbers. David Griffin was the tournament director of the event that drew three more players than the 2010 event; Tacoma Tornado #1 (May 7); Portland Saturday Quads (May 7? ); Seattle Sunday Tornado (May 8); 1st Wed. Quick Quads at Seattle Chess Club (May 4). Scholastics (April)! WA State Elementary (and Middle School) Chess Championships (Apr 29-May 1) in Tacoma, WA - for detailed ratings report see http://chess.ratingsnw.com/tournreports.html. See summaries by Rusty Miller and Gary Dorfner. Congratulations to Alexandra Botez of Clackamas, OR for winning "The 8th All Girls National Championship" (18 and under section) which took place April 8-10 in Chicago. The event was presented by the Kasparov Chess Foundation (KCF) in association with the USCF, the University of Texas at Dallas and Renaissance Knights Chess Foundation. The scholarship she won is valued at $105,000 for an out-of-state student!! (Note below that she had already won a large scholarship at the Polgar national event in March.) See the story on the USCF website. April! Portland G/60 (Apr 30) - This event attracted 19 players. Curtis Books went 4-0 for the only perfect score. Neil Dale directed the event; Seattle Adult Swiss (Apr 30-May 1); The Portland CC monthly quads on Tuesday evenings in April had two sections. Nick Raptis won the top group 3-0 while Julian Miller won the other section, also 3-0; Reno Far West Open (Apr 22-24) in Reno, NV; 5th Annual Grand Pacific Open (Apr 22-25) in Victoria, BC - See the results on the GPO website; 5th Annual Clark Harmon Memorial (Apr 16-17) in Portland, OR - The Clark Harmon Memorial 2011 drew 53 players to the Portland Chess Club. Nick Raptis continued his winning ways but his 4.5-0.5 score was matched by Curt Brooks and Alexandra Botez. Steve Breckenridge nicked Raptis for a draw in round 4; Brooks drew in round 2 with Michael Goffe and Botez took a half point bye in round 4. Both Brooks and Botez defeated Master Corey Russell. IM John Donaldson was not able to make the trip to Portland as previously announced; Seattle CC Novice (Apr 16); Seattle CC Saturday Quads (Apr 16); Seattle CC Sunday Tornado (Apr 17) - The Seattle Chess Club April Tornado had 23 players. National Master Viktors Pupols gave lessons to four much lower rated players to top the field. Fred Kleist directed the event; Daffodil Open (Apr 9) in Tacoma - Paul Bartron of Tacoma with a 4-0 score topped the 10 player event. He has more than 750 won games since 1991 per the USCF rating website. The event, directed by Gary Dorfner, was changed to four rounds in one day so the players could visit the Seattle CC on Sunday afternoon; GM Yasser Seirawan appearance and book signing at the Seattle Chess Club (Apr 10); Seattle Spring Open (Apr 1-3) - 21 players took part in the top section of the Seattle Spring Open at the Seattle Chess Club. David Golub took top honors with his 4-0 score. There was also a perfect 5-0 score in the Reserve Section, done by Nicolo Gelb. There were 38 players in this section. Tournament director as usual was Fred Kleist, who also played; Portland Saturday Quads (Apr 2) - Jerry Sherrard with a score of 2.5-.5 won the six-player April Quads at the Portland Chess Club. There were too few players for more than a one-section event this month. Alex Grom directed and also played. Scholastics (March)! 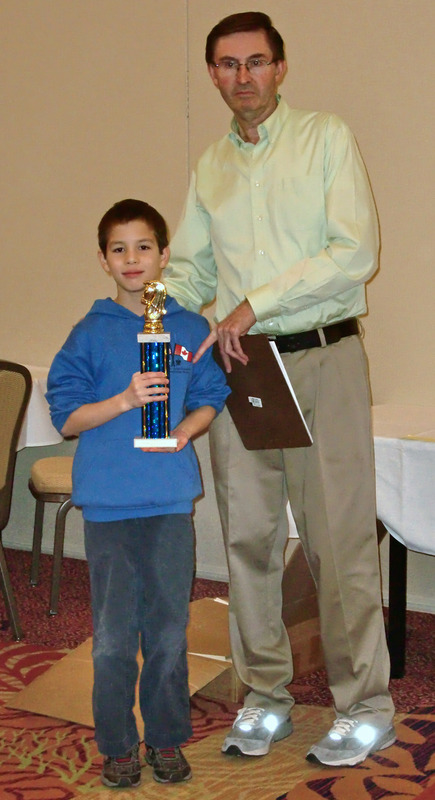 Chess for Success State Championship Tournament (Mar 4-5 in Portland) - Photo: Ethan Allison of Bend, OR receives trophy for finishing 2nd in his group, with a score of 4.5 out of 5. Over 160 kids competed in the event. Susan Polgar National Open - Alexandra Botez won the High School Girls' section of the Susan Polgar National Open with a perfect 7/7. Part of her prize includes a scholarship to Texas Tech University, valued at $40,000 for out of state students. Congratulations! The tournament, held in Chandler, Arizona the weekend of March 5-6, attracted almost three hundred juniors. WA Girls - Also, congratulations to Kate Tokareva who won the WA State Girls Championship Mar 26-27 in Redmond with a perfect 4.0 score. She will receive a stipend from WCF to attend the 2011 All Girls National Championship, Apr 8-10, in Chicago as the WA state representative. March! Seattle Sunday Tornado (Mar 27) - Playing in his first tournament in about a year, Marcel Milat scored a perfect 4-0 at the Seattle Chess Club to win the March Tornado. 24 players took part in the Fred Kleist directed event. Milat is ranked 5th out of 577 WA players according to USCF; Yakima CC Membership Swiss (Mar 26) in Toppenish - Martin Schmidt won the Yakima Chess Club March Swiss with a 3-0 score. This result made his rating go over 1800 for the first time. The tournament drew six players. Jim McAleer directed the event; Portland G/60 (Mar 26) - With a perfect 5-0 score Nick Raptis of Portland is back in the winners circle. He topped the 28 player Portland March G/60 event. One of his wins was over Carl Haessler of Lake Oswego, whose 4-1 score was equaled by Curtis Brooks and Jason Cigan. Neil Dale of Portland directed the event; Seattle Saturday Quads (Mar 19); Portland Spring Open (Mar 19-20) - There were 39 players in the 2011 Portland Spring Open held at the Portland CC in two sections. Steven Breckenridge took top honors with 4.5-0.5. Mike Terrill won the reserve with the same score which included a half point bye; Northwest Open (Mar 12-13) - The 14-player Northwest Open, organized by the Tacoma Chess Club, was won by Bruce Swiney with a 4-1 score. Bruce had not played in a USCF-rated tournament since 1994 ... welcome back! ; Tacoma vs. Seattle Match (Mar 5 at Tacoma) - See Tacoma club page; Portland Saturday Quads (Mar 5) - Jeremy Waterman of Portland scored 2.5/3 to win one section of this event. By the same score Jacob Hoglund of Gresham won the 2nd section of six players. Regional Events (March)! Some local chessplayers competed in the 18th Annual Western Class Championships, held March 11-13, 2011 in Agoura Hills, California. FM David Roper of Washington State took Under 2300 honors with 3½. See one of his games on the USCF website. Scholastics (February)! High School State Team Championship (Feb 12 in Blaine, WA) - Lakeside A and Interlake A each scored 21 out of 25 possible points for their 5-player teams. Lakeside A won on tie break. See the rating report. February! Portland G/60 (Feb 26) - Steve Breckenridge was the winner with a perfect 4.0 score; 19th Dave Collyer Memorial in Spokane (Feb 26-27) - As reported by Rusty Miller, "The 2011 David Collyer Memorial Open, sponsored by The Spokane Chess Club, drew 59 players, about the same number as past years. As usual IM John Donaldson of Berkeley CA was the top rated player and scored 4.5-0.5 for 1st place. His score was equaled by Paul Bartron of Tacoma as they drew their game in the last round;" Seattle Sunday Tornado (Feb 27); Yakima Chess Club Membership Swiss in Toppenish (Feb 19); Spokane Winter Championship (concluded Feb 17) - There was a three-way tie involving Timothy Moroney, Patrick Herbers and Nikolay Bulakh, each with 4 out of 5 points and no losses; Seattle Saturday Quads (Feb 5) - Those who won or tied for first in their quad included Igor Ummel, Daniel He, Marcell Szabo, Dan Kramlich, Aaron Palmer and James Soetedjo. Scholastics (January)! See photos from Dawn Matthes of Roosevelt Elementary Chess tournament (Jan 22); Washington Junior Open and Reserve in Bellevue, WA (Jan 17 MLK Day holiday) - See report and photos; See "Students play in Richland chess tournament" report and video from KNDO TV in Richland, WA about a scholastic chess tournament held on Saturday, January 15; See "Coquille dominates chess league" ... "Coquille's varsity and junior varsity chess teams swept the Southern Oregon Chess League, which finished its 12-game season Saturday (1/15)," from The World news, Coos Bay, OR; See Rusty Miller's photos and description on Flickr of the Fanconi Anemia Research Fund benefit tournament at Corbett (OR) High School (Jan 15). January! Portland G/60 (Jan 29) - congratulations to Brian Esler with a perfect 4.0 score, also achieving a 2006 rating; 53rd Tacoma-Pierce County Open (Jan 29-30) - Paul Bartron won with a perfect 4.0 score! ; Seattle Sunday Tornado (Jan 30); Seattle Saturday Quads (Jan 22) - quad winners included Igor Ummel and Noah Fields, with a three-way tie in two other sections; Yakima CC Membership Swiss (Jan 22) in Toppenish, WA - Jesse Frank Clark was the winner with 2.5/3; Seattle City Championship (Jan 14-16) - David Bragg won the Open section with 4/5, while James McAleer won the Reserve section with 4.5/5; Seattle CC Novice (Jan 8); Gresham Open (Jan 8-9) - Rusty Miller reports an excellent 58-player turnout; Radu Roua won with a perfect 5.0 score, defeating WA champion Howard Chen in round 4 (photo: Roua (left) vs. Chen (right), see more of Rusty Miller's photos on Flickr); that perfect score earns him the $200 Stephen Christopher Memorial Perfect Score Prize on top of the 1st place prize of about $300; Seattle Sunday Tornado (Jan 2) - congratulations to David Golub with a perfect 4.0 score.